Generally, gem-stone diamonds are graded according to four key characteristics (often known as the 4-Cs). These are carat; clarity; color; and cut. Carat is the unit of weight measurement for diamonds. Each diamond carat is equivalent to 200mg, or 0.2g. So, for example, a 5-carat diamond will weigh a gram. 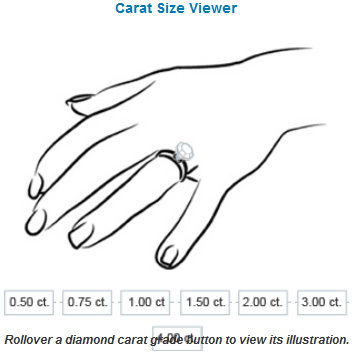 In imperial measurements, a carat is equivalent to 0.007055 ounces. 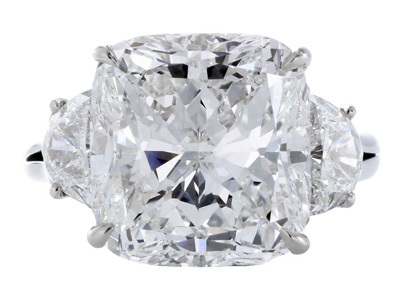 Although in theory the bigger the, better when it comes to a diamond, it should be remembered that the other “C”s play a major role in determining both the appearance of the diamond and its cost. Bigger is not necessarily better if the clarity or cut is wanting. Selecting a diamond on weight alone can be misleading when it comes to the appearance of the stone in its setting. A heavier diamond will not necessarily look proportionately bigger: for example, a round-cut stone which weights one carat will frequently be cut to form a 6mm diamond; in contrast, a diamond that weights 0.5 carats (so half the weight), will still be around 5.2mm when round cut. The weight of individual diamonds in a ring varies depending on the design and price. Smaller diamonds may be less than half a carat, whereas some rings are set with diamonds which weigh hundreds of carats. The largest diamond mined to date, the Cullinan diamond, weights a staggering 3106.75 carats! Diamond prices do not follow a linear curve when it comes to weight: heavier diamonds cost exponentially more than lighter ones. So a two-carat diamond usually does not simply cost twice the price of a one-carat stone, it will often cost significantly more. This is because larger stones are rarer. Almost inevitably, the vast majority of diamonds which are mined are smaller ones: diamond is a natural material with numerous flaws and impurities. This means that finding a large piece of diamond which not only has a decent weight but which is also beautifully clear and attractively colored is extremely rare. what level OR WEIGHT of diamond carat should I buy? There is no right answer when it comes to diamond weight. Ultimately, even if the aesthetic appeal, rather than cost, is the primary consideration, the heaviest diamond is not necessarily going to be the one that looks most appealing. At times, heavier diamonds may have the edge on the scales, but poor, or insufficient cutting means that clarity and color are not as prominent as they should be. We advise customers to take the time to look at a variety of rings or other pieces until they find the one that looks most attractive and that is within their budget. The origin of the word -carat- lies in the Mediterranean region, where carob trees have flourished since ancient times. The seeds of the carob tree were once used as units of measurement against which diamonds were weighed. One carob seed is roughly equivalent to one modern carat, the word we use today to describe the weight of diamonds. In the Far East, diamonds were historically weighed against grains of rice, resulting in the coining of the term ‘grainer’. Today, gemologists still quantify the weight of diamonds in grainers. A four-grainer diamond is equal to one carat.